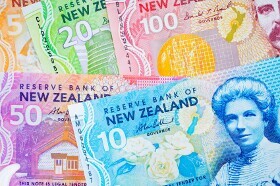 The New Zealand dollar climbed by the end of the Tuesday’s trading session and continued to rally during the early Wednesday’s session. The rally was a result of the better-than-expected inflation data. Before the report, the currency was moving either sideways or down versus its major peers. Statistics New Zealand reported that the Consumer Price Index rose 0.1% in the December quarter of 2018 from the previous three months. Analysts had predicted ahead of the report no growth at all. Year-on-year, the index rose 1.9%. Experts had conflicting opinions regarding how the data is going to affect monetary policy of the Reserve Bank of New Zealand going forward. Some thought that the central bank will change its stance from dovish to more hawkish as annual inflation was within its 1%-3% target range. Others said that the quarterly increase was too small for the RBNZ to shift its stance. NZD/USD advanced from 0.6749 to 0.6768 as of 00:33 GMT today. EUR/NZD traded at 1.6784 after opening at 1.6807 and attempting to rally to 1.6851. NZD/JPY rose from 73.81 to 74.10.